Event Description : LIFESTYLE EXHIBITION : Dastkari Haat Samiti is presenting an exhibition that showcases Kasavu sarees of Balarampuram by ANKA. The exhibition aims to support the weavers of Kerala affected in the recent catastrophic floods. Ms. Jaya Jaitly, Founder and President of the Dastkari Haat Samiti, is organizing a 9 day exhibition which will take place at Dastkari Haat Studio, situated at 12, Meherchand Market, Lodhi Colony. 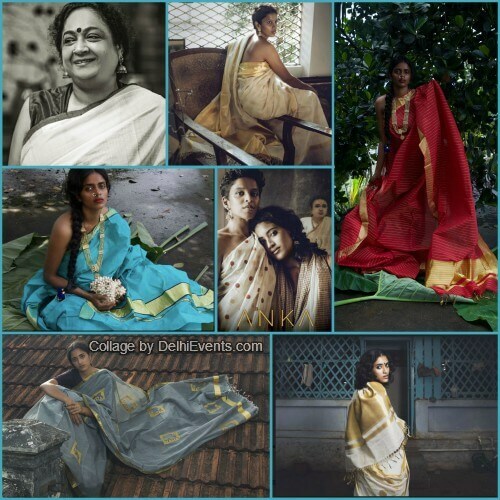 The exhibition aims at the contemporary retelling of the traditional cream and golden weaves of Kerala, in collaboration with ANKA, an endeavor by Dr. Usha Devi Balakrishnan. With modern Kerala as its muse, they are known to experiment with the traditional textures and patterns, making the drape an amalgamation of contemporary with tradition. This exhibition is a tribute to not all the weavers but to all the people who have been drastically affected by the calamity which shook Kerala at its very base this year. Dr. Usha Devi Balakrishnan’s endeavor ANKA aims at reviving and sustaining the weaving communities of Balarampuram. The exhibition will touch upon Anka’s drapes, which can easily remind one of the spirit of a lush green summer or a lazy summer afternoon, as they have been woven using dyed yarn intertwined with beaten gold zari. Their drapes in soft pastel shades are an elegant blend of cotton and silk, gleaming against gold, forms the heart of ANKA’s Anika collection. Their drapes in bright colors bring out the golden zari work. The drapes simplicity makes it a timeless piece of textile. In course of the exhibition one will experience their various collections and drapes which are no less than a piece of artwork, that has been brought to life by over 20 master weavers and with a workforce of over 150, most of which are women. The weavers and the workforce have all suffered at the hands of the recent catastrophic floods, which recently hit the state of Kerala. Harboring a passion for textile and handloom, Dr. Usha Devi Balakrishnan decided to pursue it after leading a life as a public servant. Dr. Usha Devi Balakrishnan is retired from the post of Regional Director of Kudhumbshree Project which is a government initiative setup to help people living below the poverty line, by organizing them in self-help groups in order to make them financially independent. She has taken this forward by providing training to the rest of the community especially women. Just like Ms. Jaya Jaitly’s initiative, Dr. Usha Devi Balakrishnan also works tirelessly to sustain the traditional handloom by inspiring innovation with new modes of creativity, so that the Indian handicrafts can become a fragment of the contemporary world along with it sustaining the traditional skills and livelihoods. “What these weavers do, others cannot. They weave a fabric that looks the same on both sides. There is no good side or bad side. And the reason I chose to work on Kasavu is that I noticed that the weaves from Kerala were not seen in most exhibitions and many people were not aware of its technicality, style or work. So I decided to address the issue and work only with this weave”, shares Dr. Usha Devi Balakrishnan.